Consider you have three campaigns Campaign #1, Campaign #2 and Campaign #3 running on 3 different pages. Each of these campaigns have a control (original) version and a variation (changes you made). Any user landing on the original (control) version of step 1 will route to the control version of step 2, and so on. If a user lands in a particular variation of page 1, then the user will be routed to the related variation in page 2, and so on. 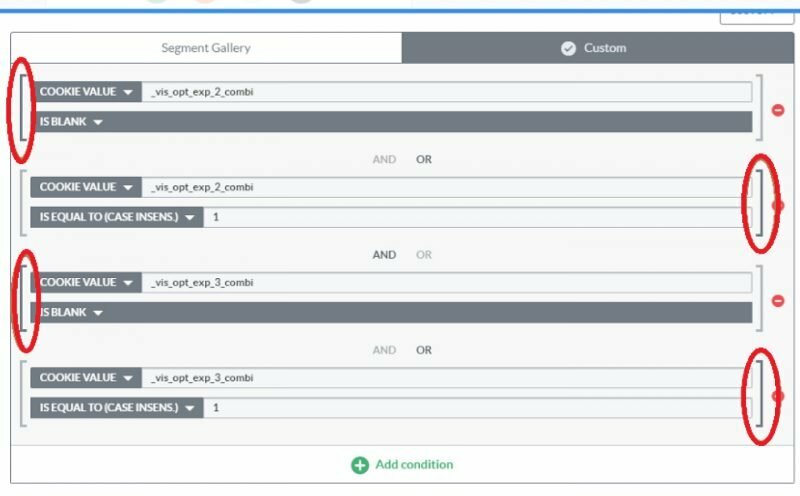 You can set the cookie based variation targeting and set custom segment conditions. To target variations, navigate to the Settings page of the campaign and go to Targets section. All variations you have created under the campaign displays. Similarly, set up cookie segmentation for each variation in your campaign. _vis_opt_exp_CAMPAIGN_ID_combi is the cookie generated when users become the part of a particular combination of a campaign. In the combination cookie, the Control always has the value of 1, Variation #1 always has the value of 2, Variation #2 has the value of 3 and so on. The cookie value “is blank” condition will be met when the visitor is not yet part of the corresponding campaign.